Are my wires in this junction box too short? This my first attempt at a junction box . I am kind of worried the wires are too short. They are all in the push connectors. Is this safe? Ground the box itself. That ensures that there's no chance the box itself can become energized, because if a hot wire ever touched the box, it would trip the breaker. Unlikely situation, but I always do that when I'm working with metal boxes just to have some peace of mind. You should be able to do this with a common ground screw. Plug those open holes unless there are more wires going in there. You can buy little knockout plugs for less than $.50 at most home improvement stores. Open holes into a live electrical box are never a good idea. In the future, I'd leave a little bit more extra wire in there, but it should function just fine assuming you've used the correct gauge wire for your current rating. The work is solid with a few exceptions. Yes, that's too short. You should be leaving 9-12 inches. The legal minimum is 6" past the clamp, or able to reach 3" beyond the finished wall surface. It can seem cluttery, but cluttery is good. Are you using a book on electrical? The book would tell you this. People learning electrical work best when they have a general overview of all aspects - a primer if you will. Google can't substitute because Google only answers questions, and without a well rounded set of concepts, it's hard to know all the questions you should be asking. You will need to replace all three legs, and you will be better off doing it now, rather than waiting until the drywall is up, you are doing any kind of maintenance, and you are forced to improvise. Remove the old cables carefully and you can reuse them - maybe even for each other. These push connectors are particularly problematic with short wires, because it is annoying/difficult to wrest the wires out of the push connectors, so people usually just snip them. You'll want even more length for that. Some people get snipper-happy and go out of their way to cut wires as short as they can. Perhaps they think there are brownie points for that... Code does mention "neat and workmanlike", but functionality and maintainability come before neatness. 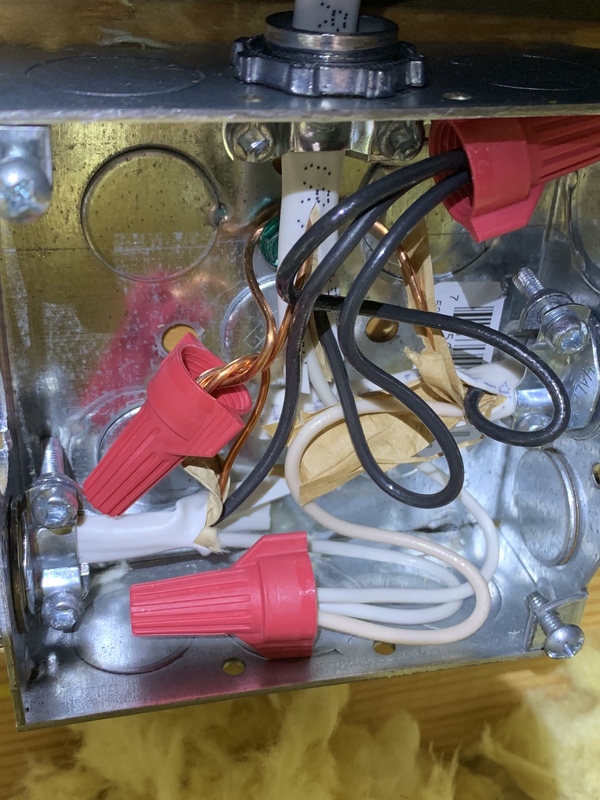 Another trouble spot is the panel - it's in vogue to go snip-snip*, but for maintainability, you should give every circuit enough length so both hot and neutral can reach every breaker position in the box. You need to ground the box also. Most boxes have a threaded 10-32 hole in the back for a ground screw. Some are on dimples so they work flush against a surface, look for that feature in boxes. They sell special green #10-32 ground screws. But any will do. Do not use a deck screw or sheetmetal screw unless it is cut -32 thread or finer. Rather than spend a big budget on connectors, I would recommend using wire nuts instead. Not least because you can take apart wire nuts and reassemble them. But even more, because wire nuts produce reliable connections, and push connectors - like any backstab - are notorious for series arcing and failure. At least you are in a metal box, which will contain all but the worst series arcing. I also see where you have knocked out two additional knockouts. You need to fill those with knockout plugs. Those are trivial cost, about a buck for five. Alternately, if you are expecting more cables to come in, you are painted into a corner with those push connectors. Assuming you'll have 5 cables, it's time to start talking about box fill. If the box is getting too crowded, you can get either box extensions or "mud rings" which provide some additional cubic inches. On the Web there are "official" tables and calcs for box fill, but if you are leaving yourself 9-12" of wire, you'll know when boxes are getting crowded. The takeaway is that extensions (and larger boxes) are available. My signature box when I have >5 cables converging is the 4-11/16 square x 2-1/8 (120 x 55mm) which I buy at electrical supply houses, where they are much cheaper. * check out this disaster of a box. Looks purdy, but now add a generator interlock and a whole house surge suppressor: those need to go on top, so every breaker must move down 2 spaces. That expensive subpanel cable definitely will not reach, ouch! And then, when they add GFCI or AFCI to some breakers, none of the neutrals can reach. But he leaves lots of slack for the short service line (why?) Also, the panel is completely full, so it was a poor choice. In addition to everything else everyone's said, if you don't have any spare length in the wires, it limits your ability to make changes to your wiring later. You would struggle for example to bring in a 4th wire, and you've no spare length to correctly wire the earth wires to the metal box. You may also need a little slack if you later adjust another fitting, or split a wire to make another spur off the ring. Looks ok I think it will work just needs a little sprucing up . Providing your cable runs are long enough you may want to insert additional cable into the metal box, if you do. Strip back the cable sheathing within the metal box at least 6inches then connect them to the push in connectors ,also ground the box itself either by adding an additional bare wire to your connector if it is a 4slot type connector if not then loop an existing ground wire clockwise to the ground /bonding screw sometimes they are green . Also reverse all of your clamps have the screw portion of the clamps on the outside of the metal box and then use knock out plates to cover the two spaces on the left side of the box. Not the answer you're looking for? Browse other questions tagged electrical wiring junction or ask your own question. Electrical wiring/grounding - continuity via metal junction box? Power wires too short, what to do? Are all ground wires inside electrical junction box grounded? Are splices required in a junction box? 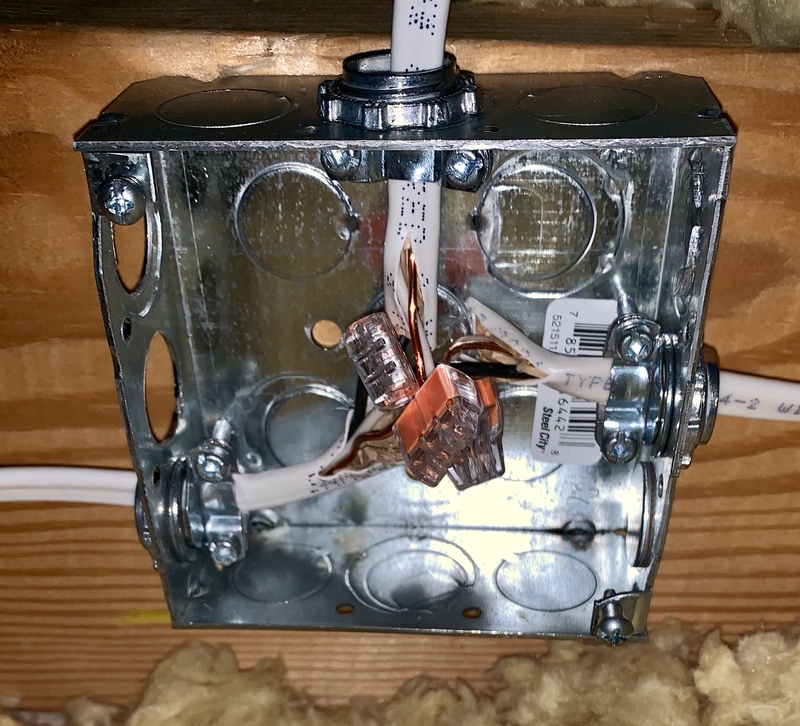 Do the quick connectors in my new bathroom fan need to be in a junction box?